RadioShack is getting a marketing makeover. Starting August 6, the venerable electronics retailer will change its name to "The Shack," a rebranding move designed to shed the last-century association with creaky radio technology and embrace today's digital wireless world. To celebrate the name change, RadioShack will conduct a "Shack Summer Netogether," a live event featuring two 17-foot laptop computers in New York and San Francisco. Equipped with Webcams, the gargantuan notebooks will allow live video and audio exchanges between the two cities. When I think of RadioShack, batteries, capacitors, transistors, and various obscure components come to mind. Yes, I'm aware "The Shack" sells flat panel TVs, netbooks, and cell phones. But for big-ticket electronics items, I drive to big-boxes retailers like Best Buy or Costco, or maybe browse online vendors like Amazon. 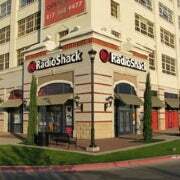 The last time I went to Radio Shack was to get a new battery for my cordless home phone. Before that, it was to buy a recording device for my mobile phone. And that's the problem. Too many consumers see Radio Shack as the go-to place for obscure electronics doodads, not as a worthy competitor to Best Buy or the wireless kiosk in the mall. "We have tremendous equity in consumers' minds around cables, parts and batteries, but it's critically important that we help them to understand the role that we play in keeping people connected in this highly mobile world," said RadioShack chief marketing officer Lee Applbaum in a statement. "You will see a real focus on mobility and wireless products from leading brands in our new advertising." "When a brand becomes a friend, it often gets a nickname -- take FedEx or Coke, for example. Our customers, associates and even the investor community have long referred to RadioShack as 'THE SHACK,' so we decided to embrace that fact and share it with the world," said Applbaum. I can't fault RadioShack for trying to upgrade its image, and I hope its strategy works. But it seems to me the retailer's biggest problem isn't its name, but rather its shoebox-sized stores. After all, there are just so many HDTV sets, notebooks, netbooks, smartphones, and Blu-ray players you can cram into a space that's slightly larger than a Jamba Juice. With its limited showroom space, The Shack simply can't compete with the big-boxers of the world. Then again, the next time I need a new calculator battery, I'm heading to Radio, er, The Shack.